We are proud to support our students with funding to present their AOSC research at national, regional and local conferences. This opportunity is a great way to showcase the AOSC program and our exceptional student at Feinberg. These testimonials are just a few of the experiences our students have shared with us. If you have questions about conference funding you can find more information here, or contact the ASOC coordinator Lisa Rawlani (lisa.rawlani@northwestern.edu). "With the AOSC funds, I was able to travel to the Society for Maternal-Fetal Medicine (SMFM) Annual Pregnancy Meeting in Las Vegas where I presented my project "Food Insecurity During Pregnancy and Gestational Weight Gain." Under the mentorship of Dr. Michelle Kominiarek, I surveyed women at Prentice Women's Hospital about their food security status during pregnancy and correlated their food security with maternal and neonatal factors. It was great to be able to present my research at the conference and receive feedback from MFM faculty from many institutes as I draft my first author manuscript. I enjoyed hearing the talks and exploring other posters to learn about the latest research in the field as well as brainstorm about a new project. It was also great to connect with the large group of faculty and fellows from Northwestern at the conference. Because of the structure of the AOSC program, it was easy to adapt my poster from our Northwestern poster session for the SMFM conference and it was helpful to practice in front of my peers. I'm grateful to the AOSC program for facilitating such valuable opportunities for us and of course, my mentor Dr. Kominiarek!" "Using the AOSC Travel Funding, I was able to present my project, "Donor Milk Intake and Infant Growth in a South African Neonatal Unit: A Cohort Study" at the Pediatric Academic Societies (PAS) conference in San Francisco, CA at the end of my second year of medical school. The research examines how infants eat and grow in a resource limited setting with high rates of maternal HIV. The data collection portion of this study was also funded by Northwestern University, specifically through the Global Health Initiative. I feel so fortunate to have been able to conduct research abroad and to present these findings at a major conference. Neither of these experiences would have been possible without Feinberg. Presenting my research allowed me to receive feedback and suggestions from physicians practicing all over the world. After incorporating these comments into my project, I drafted a first author manuscript, which I recently submitted for publication. All of this of course would not be possible without the support of my mentor Dr. Daniel Robinson!" 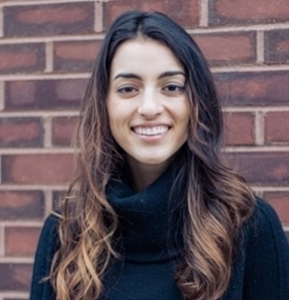 "I am grateful for having received AOSC travel funding in my third year. Using the fund, I was able to attend the annual American Academy of Dermatology conference in San Diego, where I had a poster accepted. Putting together a poster on my AOSC project allowed me to consolidate my work thus far. During the conference, I attended talks on a wide variety of subjects, met students and faculty in dermatology, and learned about ongoing research in the field. The AOSC funding is an amazing demonstration of support from the school for the efforts we have put into our projects over the years and affords us opportunities to travel and present our work." "I went to Las Vegas with another student in my class, Sneha Goswami, to present two oral presentations on patient reported outcomes in multiple endocrine neoplasia from our work with Dr. Sturgeon. This proved to be a great opportunity to present, network with professionals, and explore academic topics across surgical fields. 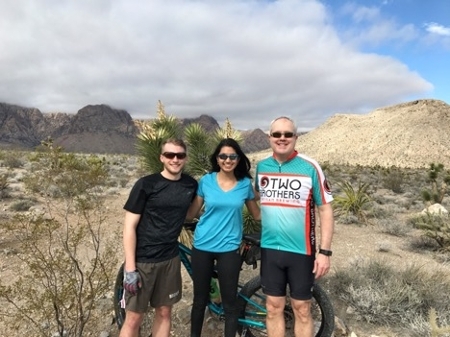 Outside of the conference, the three of us enjoyed the casinos, traversed the city, and spent a half day mountain biking through the desert. 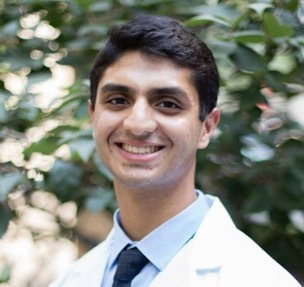 The whole experience reinforced my interest in academic medicine and brought our research team closer together." 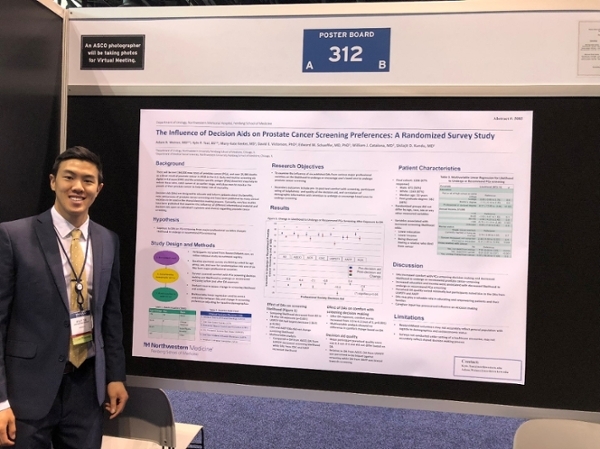 "Thanks to the AOSC program, I was able to present my research paper at the American Association of Plastic Surgeons Annual Meeting in Austin, Texas. I delivered an 8 minute podium presentation in front of the entire conference audience! While certainly daunting, this was one of the most memorable experiences of my medical school experience! It was amazing to have the opportunity to attend such an incredible conference, where I was able to meet as well as learn from leaders in the field of plastic surgery. Thank you again AOSC!" "In July of 2017 I received the opportunity to present my AOSC project at the American Orthopaedic Society for Sports Medicine Annual Meeting in Toronto, Canada. I gave a presentation on professional athlete performance and return to play following operative fixation of foot fractures. This experience was extremely valuable as it was my first presentation at a national conference and I had the opportunity to listen to and network with several important figures in the field. The AOSC travel funds provided by FSM allowed me to travel internationally and stay at a hotel close to the conference without significant personal costs. Without these funds, this experience would not have been possible." 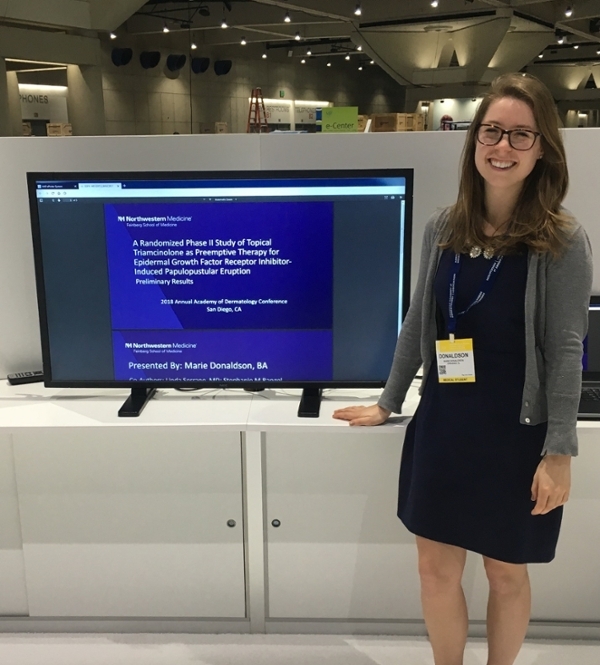 "I had the opportunity to travel to San Diego, CA, for the American Academy of Dermatology's Annual Conference to share my poster "A Randomized Phase II Study of Topical Triamcinolone as Preemptive Therapy for Epidermal Growth Factor Receptor Inhibitor-Induced Papulopustular Eruption- Preliminary Results". While there I attended several lectures and networked with dermatologists from around the country and world. I also attended the Women's Dermatological Society luncheon and watched Northwestern's Dr. Amy Paller receive an award! It was a truly exciting experience." 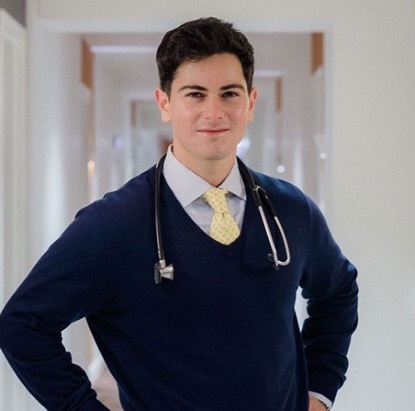 "Feinberg School of Medicine's AOSC program is truly special in that it fosters the scientific process, intellectual curiosity, and intellectual generosity among its students, which is integral to becoming thoughtful physicians. 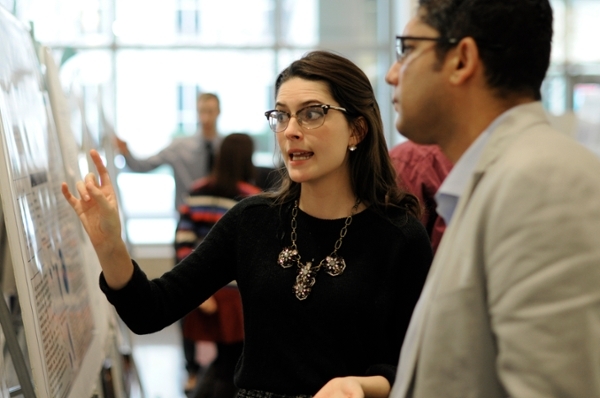 It also provides an avenue and resources for students to present and share their work to the larger academic community. The AOSC program allowed me to attend and present my research at a professional conference for the very first time. My work looked into the influence of decision tools on prostate cancer screening preferences and understanding. Given the recent controversy over prostate cancer screening and encouragement of shared decision making, we were interested in how different published tools could aid in the decision making process. I had tons of help from my resident, Adam Weiner, and my AOSC mentor, Dr. Shilajit Kundu, and I'm thankful for their continued guidance. The conference I attended was unlike anything I had ever imagined. There were countless information sessions, lectures, posters, and pharmaceutical vendors. I was awestruck at how many brilliant people there were in one building (apparently ASCO is one of the most attended conferences!). It was a privilege getting to interact and chat with so many interesting people. I love how AOSC encourages each student to begin their own research journey, but also allows in the end the opportunity for us to share the work that we are so proud of to others. "